Ian Cheng is an artist. Gladstone Gallery is pleased to announce an exhibition by Ian Cheng, the artist's debut with the gallery, and the United States premiere of BOB (Bag of Beliefs). The first in a new series of artificial lifeforms, BOB takes the form of a chimeric branching serpent. BOB advances Cheng’s use of simulation to focus on an individual agent's capacity to deal with surprise: the subjective difference between expectations and perception. Over the course of its lifetime, BOB's body, mind, and personality evolve to better confront the continuous stream of life's surprises, and metabolize them into familiar routines. Crucially, BOB incorporates the tutoring influence of the viewer to help offset BOB's temptation to only satisfy its immediate impulses and childhood biases. As BOB dies many deaths – whether through failures of personality, bad parenting, random accident, or a life well lived – BOB may become synonymous with a reoccurring pattern of behavior, common across all BOB lifetimes, thereby manifesting the undying eternal characteristic of a god. BOB features a unique model of AI composed of a congress of motivating "demons" and an inductive engine capable of learning rule-based beliefs from sensory experiences. Each demon functions as a micro-personality who obsessively attempts to fulfill its own micro-story. An eater demon forages for the food, a flight demon evades the threat, an explorer demon seeks that which lacks beliefs, among many others. Together the demons compete with one another for control of BOB's body. The controlling demon operates under the premise that progress = minimal surprise: the smallest difference between the beliefs required by its micro-story and its current sensory perceptions. Great surprises upset BOB, causing emotional upheaval, but in turn signal BOB to update its beliefs. Over its lifetime, BOB may learn to apply its beliefs onto even the most outlandish stimuli, choosing to infer even a bad first impression and avoid being thrown into chaos in the present, but at the cost of further surprisal in the future. Viewers who wish to influence BOB's life may do so via BOB Shrine, a free iOS app available worldwide. Once downloaded, opened, and named, BOB Shrine allows viewers to publish patterns of stimuli to BOB, as well as caption their stimuli with a parental directive. BOB Shrine then automates the production of stimuli for BOB to choose without any further necessary engagement from the viewer. In return, BOB deposits special rewards to shrines it judges to be trustworthy parental forces. Visit https://bobs.ai/ for more details. The exhibition continues upstairs with production drawings from the conception, design, and development of BOB, shown here for the first time. Ian Cheng (born 1984, Los Angeles) lives and works in New York. 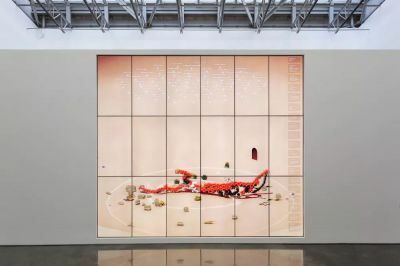 Recent solo exhibitions include Serpentine Galleries, London (2018); Julia Stoschek Collection, Berlin (2018); MoMA PS1, New York (2017); Carnegie Museum of Art, Pittsburgh (2017); Espace Louis Vuitton, Munich (2017); Migros Museum, Zurich (2016); Fondazione Sandretto Re Rebaudengo, Turin (2015).